Having Her Cakey and Eating It! The lovely Chantilly who had such a tragic start to her little life has finally found love and friendship in Cakey who has also had a rough time of things lately. 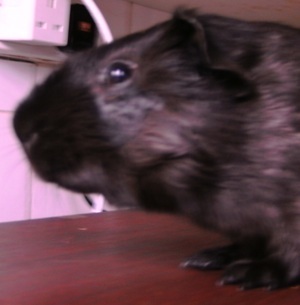 Read Cakey’s story on www.gorgeousguineas.co.uk/blogChantilly was discovered by a German Shepherd Dog on some wasteland, running with a group of guinea pigs. On arrival she was obviously pregnant and obviously still only a couple of months old. 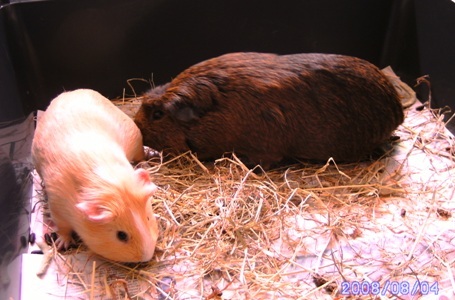 Guinea pigs are able to give birth at an early age and much of the time it goes without complication, however being present when Chantilly gave birth to Mr Big and two pups that were dead on arrival was not something that I found enjoyable. Chantilly had the most stressful time giving birth that I’ve seen. Cakey’s little Human chose Chantilly to be Cakey’s next friend and first sowfriend. Both are now living in brand new accomodation after the honey moon period at the holiday home. We hear that this is a very well matched and playful couple. Chantilly’s new name is Lemony Chase. Cakey and Chantilly getting to know each other. After having 3 litters and only 6 babies I think I have got off quite, no extremely, lightly! To make things even better Ithe sow fairy has spent some time here and I have 4 sows and 2 boars- 6 boars could’ve been so much more of a problem! But they don’t stay babes for long and already they’re coming on in Wheeks and bounds, Sienna’s pups were 5 weeks old this week and I felt it was time to give mum a bit of space and put them in with their ‘aunties’. 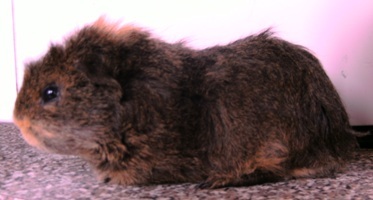 Sienna had two back to back litters and has coped well, but time comes when everyone deserves a bit of peace and quiet. She wasn’t at all bothered when I put the girls in another cage, they’ve spent short spaces of time apart before but this was the big one and it all went swimmingly 🙂 No fuss from the girls either, a lovely secure little bunch they are. 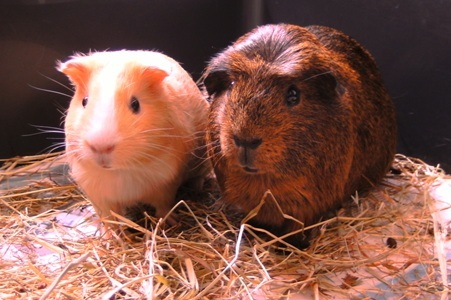 Marley and Mr Big are still living happily with Solo and everyone seems equal, except when it comes to food that is… Both Marley and Mr Big are turning out to be long haired like their dad. Mr Big is Sheltie type and Marley is difficult to describe! He is definitely Rexoid, and looks either Merino type or Texel, but has a strange mane that just grows ‘up’ which at first suggested he was Alpaca! An Alpaca without the rump rosettes perhaps! You can have extra rosettes so surely one or two less counts too?! He’s gorgeous and soooo laid back anyways. He lets the other two do all the talking and keeps himself to himself. 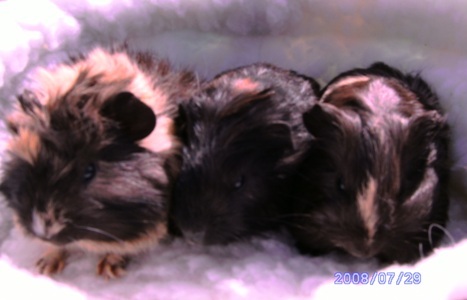 Magic and Merlin visited Jenny earlier this wheek to be castrated. 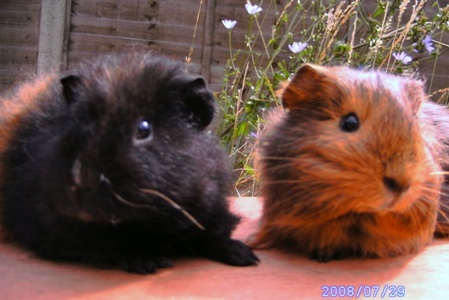 Both are approximately 15 wheeks old now. They sailed through the operation and save for the bit where they were opped on you’d never know what they’d had done. Both were munching on grass and dandelions when I went to pick up about 3 hours after their operation! Both are happy living together at the moment but having them castrated gives me the option of putting them with a group of sows each if they do start to fight. Unfortunately there is no room to keep single boars here at the moment. This year has seen the most litters born here in a year (and there was potential for more) and the most ‘dumped and left to die’ guineas that have found their way here. I wonder if the latter is a sign of our economic times? Its certainly not an excuse to dump pets, though financial problems are certainly a reason to rehome pets (or even a reason not to take any on), but there are ways of doing it. 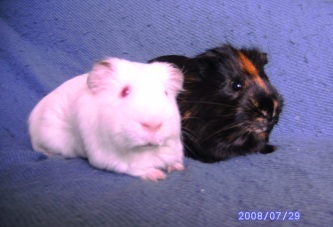 Magic (black) and Merlin (white) just after they had arrived home after their castrate. Lucas and Broc arrived here seperately but on the same day and have ended up together as hutchmates. Both are boars with Broc being adult and Lucas, I was told, is 14 wheeks. The lovely Lucas was taken into a vets because of a skin condition that needed treatment, however his Humans didn’t think he was worth the pennies so opted to have him put to sleep. He was signed over to the vets who contacted me to ask if he could come here, so here he is! He was diagnosed with mange but the flaky skin pointed more towards a fungal problem and given that mange treatment often aggravates the skin more it was decided to try and clear this up using the gentlest products available first. He started his course of Gorgeous Guineas Lavender and Myrrh Lotion (made from scratch so they don’t have to) at once, having twice daily applications at first. He’s only having the one now but the skin is barely visible through all the new hair that is growing back 🙂 He has had his second check up at the vets who were astounded at the progress he’d made with such simple treatment. 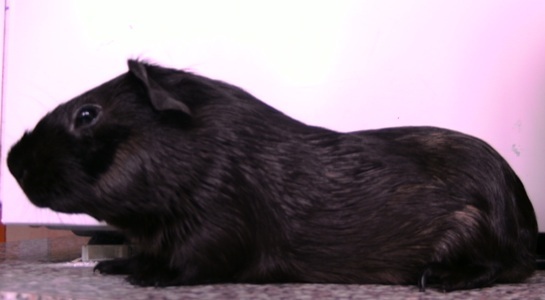 Although our vets stock Gorgeous Guineas products they never cease to be amazed at what they can do with so little effort to help guinea pigs. I’m thankful that at least Lucas’ Humans recognised he needed veterinary care and sought help at once, if left this could have been quite dramatic and would’ve taken longer to clear up. 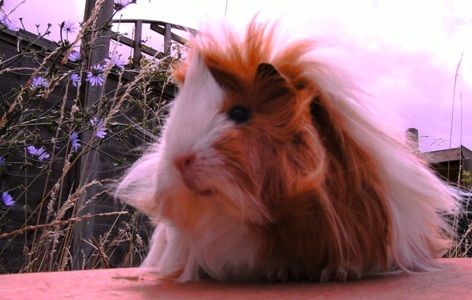 Because of Gorgeous Guineas yet andother drama has been delayed and diverted, and a crisis avoided. Broc is one of the most chilled out guineas ever. A Lemon Agouti Rexoid with a white crest he spends a lot of time chilling out and occasionaly pops his head up to have a look at the girls nextdoor. He was found dumped in someone’s garden in a cardboard box with some Broccoli in. He’s settled well with Lucas and keeps him in order if he gets a bit too assertive. He’s also been back for his health check and given the all clear for being rehomed once he’s spent the time needed here.